Perhaps you don't know much about M. Ward. No worries. I didn't either. I had heard of him. I had been told I should be listening to him. I knew he was the Him of She & Him. (The She being Zooey Deshanel: cue the "ohhhh's") I should add here that I have only heard a few S&H songs (good, but not my style) so my thoughts are strictly on this album alone. 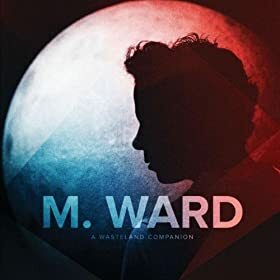 My thoughts: M. Ward has a unique sound that is country folk with a hint of Americana appeal. Some tracks like "Sweetheart" and "I Get Ideas" sound like they are straight off of the American Graffiti soundtrack. Shouldn't I be drinking a milkshake in a poodle skirt right now? And then the next half of the album is reminiscent of a modern Bob Dylan. The tracks are either intimately acoustic or vintage pop. For my taste, I favor the former. Songs such as "Clean Slate", "Crawl After You", and "There's a Key" are hauntingly exquisite. His gruffly melodic voice is harmonized by only the rasp of his guitar, and it's magic. Then, you can hear his gospel influence with tracks like "Pure Joy" with the soft harmony of a back up choir. Those songs are perfect for an album entitled "A Wasteland Companion" while others feel a little out of place. All in all, the majority of this album is perfection, but I could have lived without the She & Him'esque tracks. Even if they are catchy as hell. This album is an old fashioned American road trip from the vintage 60's era of the West Coast to the dusty railroad back-country of the midwest. Great review! It's interesting because She & Him used to be my style. I loved them so much when they first came out, but now I'm sick of their sound. M.Ward is brilliant though. Not enough people appreciate his greatness.